Between 1660 and 1820, Great Britain experienced significant structural transformations in class, politics, economy, print, and writing that produced new and varied spaces and with them, new and reconfigured concepts of gender. In mapping the relationship between gender and space in British literature of the period, this collection defines, charts, and explores new cartographies, both geographic and figurative. 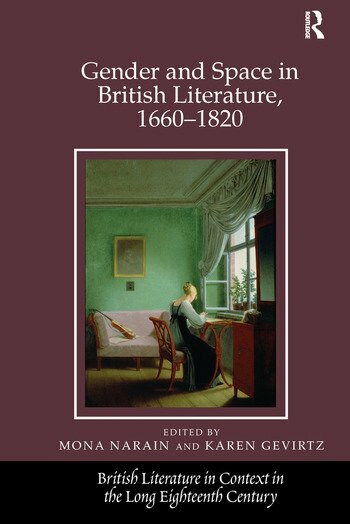 The contributors take up a variety of genres and discursive frameworks from this period, including poetry, the early novel, letters, and laboratory notebooks written by authors ranging from Aphra Behn, Hortense Mancini, and Isaac Newton to Frances Burney and Germaine de StaÃ«l. Arranged in three groups, Inside, Outside, and Borderlands, the essays conduct targeted literary analysis and explore the changing relationship between gender and different kinds of spaces in the long eighteenth century. In addition, a set of essays on Charlotte Smith’s novels and a set of essays on natural philosophy offer case studies for exploring issues of gender and space within larger fields, such as an author’s oeuvre or a particular discourse. Taken together, the essays demonstrate space’s agency as a complement to historical change as they explore how literature delineates the gendered redefinition, occupation, negotiation, inscription, and creation of new spaces, crucially contributing to the construction of new cartographies in eighteenth- and early nineteenth-century England. Mona Narain is Associate Professor of English and faculty affiliate in the Women’s Studies Program at Texas Christian University, USA, and Karen Gevirtz is Associate Professor of English and Co-Director of the Women and Gender Studies Program at Seton Hall University, USA.